The objectve of this work is to prepare a technical conservational plan for an architectural detail in Akko’s Khan El Faranj. 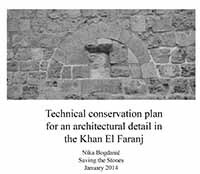 The methodology of the work includes an overview of the Khan El Faranj, the general survey of the architectural elements in the Khan, a choice of a specific architectural element, the graphic information of the element, the state of preservation and the causes, as well as the proposed solutions. A project within the framework of "Saving the Stones: Practical Conservation Training Internship".